The global popularity of esports is capturing the attention of investors and companies. Esports, or electronic sports, is the competition of video games that requires dexterity, foresight and strategy. Some of the more popular games include League of Legends, Call of Duty, PubG, and Overwatch, where global tournaments with prizes that can reach millions of dollars entice gamers from around the world to aggressively compete. “I play an average of three to four hours every night after school,” says Loo. “It’s the best way to unwind, and all my friends are on there.” With video game players sharing similar statements and playing online together, the revenue from esports grew from $250 million in 2015 and is expected to reach $1.5 billion by 2020, according to Newzoo, an esports data expert. A sweeping global phenomenon, esports’ total audience growth rose from 235 million in 2015 to 385 million in 2017, with an average revenue per fan amounting to $3.64. These numbers are only set to grow, with demand coming mostly from North America and the Asia Pacific region. China and North America alone generated $362 million, more than 52 percent of esports revenues in 2017. With a score of young millennials as players and fans, esports is uniquely positioned to overthrow the traditional understanding of sports to combine media entertainment, team strategy, and mental dexterity, all while eliminating any real physical element. Given the level of excitement and increase in esport spectators over the past few years, many companies are banking on projections for the industry to become the next big spectator sport. Big names like Microsoft, the New York Yankees, Amazon, Red Bull, and Chinese internet company NetEase, have all invested heavily in the development of teams, venues and games. Blizzard Entertainment recently opened its Burbank, Calif., venue called Blizzard Arena with the launch of their Overwatch league, a global pro circuit that competes regularly. The arena can seat 450 fans and, with giant screens to display high-definition play-by-plays for each game character, the audience can receive a plethora of information while following the live game. 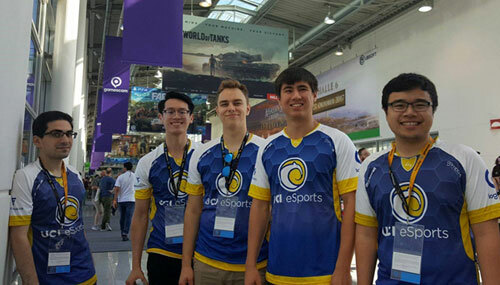 University of California, Irvine (UCI), has become the first public university to create an official esports program that is pioneering academic research, building thriving communities and grooming some of the best esports athletes in North America. Qualifying for a scholarship is no easy feat for students looking to explore esports as an academic option. UCI offers scholarships for League of Legends and Overwatch games, and seeks students who have a high ranking on the online ladder system. They analyze a player’s statistics to objectively measure how talented they are in understanding game dynamics, teamwork and their specific roles within a game. Scholarship recipients must also have a strong academic background that will guarantee admission into UCI, which often also involves an extensive interview process discussing academic goals and ambitions. “Esports is definitely a community space, and people want to engage authentically,” says Deppe. “It’s important to position your brand in such a way that people connect positively without feeling bombarded or offended.” While there is a great level of opportunity for businesses in this fast-growing industry, marketers should be aware that the medium to advertise and connect with the audience is vastly different from any others. In addition to establishing a genuine connection with consumers, businesses must be aware of content rights. Because the game developers and studios own the content of certain games, businesses should exercise caution when using the game to market products and services. According to Newzoo, 2017 esports revenue streams included game publisher fees, media rights, advertising, sponsorships, merchandise and tickets. Sales of esports content licenses are estimated to reach $95 million globally, an 82 percent increase from 2016. “Understanding that you’re dealing with a quote unquote sport that has an owner who owns all the rights, from the rules, the players, the visuals, the sounds, etc., makes esports different from any other sport,” says Deppe. Playing games and watching gaming content may have been a hobby 10 years ago, but today it is a viable means to a successful career or business investment. 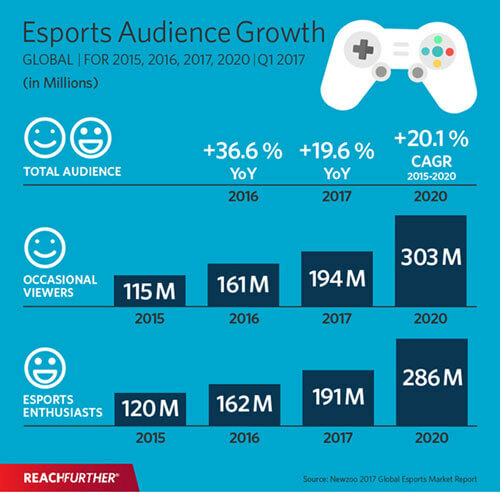 With millions of dollars in opportunities for both players and businesses, esports is set to continue growing rapidly in the competitive gaming and sports entertainment sectors. –This article originally appeared on Reach Further. About the author Reach Further (www.eastwestbank.com/reachfurther) by East West Bank is a business news magazine with in-depth insights on US-China business, trade, tech, innovation, entertainment, lifestyle and more.